The 5th & final stop of ASICS Relay 2018 will take place in the lion city, Singapore! Returning for its second year, ASICS Relay Singapore 2018 aims to attract 1250 teams of 4 and provide every participant with a fulfilling night running experience. Flagging off from Sentosa’s Palawan Green, the race village will be filled with Instagram-worthy activities while the race route will be scenic & beautiful! Runners are in for a night of fun & fitness with friends! What’s more, the winning Full Marathon Male, Female and Mixed teams will be rewarded with flight tickets, accommodation and race slots to an ASICS Relay 2019 run in another country. Form a team of 4 today and relay with us at ASICS Relay Singapore 2018! You’ll be bringing home an attractive finisher’s medal and a whole lot of good memories! * Only 1 runner from each team is required to collect the Race Pack on behalf of the team of 4. * The Race Organiser reserves the right to refuse participants without the above documents from collecting their race packs. You may authorize a Representative to collect your race pack for you. 1. A copy of their NRIC/Passport (Both soft and hardcopies are accepted). 2. A copy of your Confirmation Slip (Both soft and hardcopies are accepted). All Participants will receive a set, no matter which category you are in! To encourage teams to move, and push beyond their limits for ASICS Relay 2018, prizes will be given to the top Full Marathon Teams. (Male, Female, and Mixed). 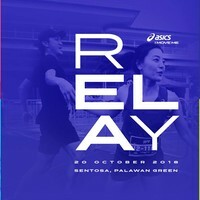 The 3 champion teams will be flown to race in the upcoming ASICS Relay in the country of their choice. 2. Prize will be forfeited if it is not redeemed within the 365 days. 3. The team is required to race in the Full Marathon race category. 5. If the team consist of residents from the country they had won the race, the team will be sponsored with return air tickets for a round trip to and from the specific country of residence. If the team consists of non-residents from the country they had won the race, the team will be sponsored return air tickets which will be capped at SGD $250 per pax. 6. The prize is not exchangeable for cash. 7. The airline and hotel is determined by Event Organizer, HiVelocity Pte Ltd.
8. The prize and any rules, terms or conditions may be amended by HiVelocity Pte Ltd., at any time and will be applied and interpreted within their sole discretion. What are the race categories available for registration? Ans: 42KM Full Marathon – Male / Female / Mixed. Each runner will complete the same distance of 10.5KM, which totals up to the 42KM Full Marathon race distance. 21KM Half Marathon – Male / Female / Mixed. Each runner will complete the same distance of 5.25KM, which totals up to the 21KM Half Marathon race distance. Can the stronger members of our team run a further distance than the weaker members? Ans: No. If your team registered for the 21KM race category, all four runners must run 5.25KM each. If your team registered for the 42KM race category, all four runners must run 10.5KM each. Does each member have to complete running the distance at one go or can he run multiple times? Ans: No. If your team registered for the 21KM race category, each runner must run 5.25KM at one go before handing the Relay Token to the next runner to start running. 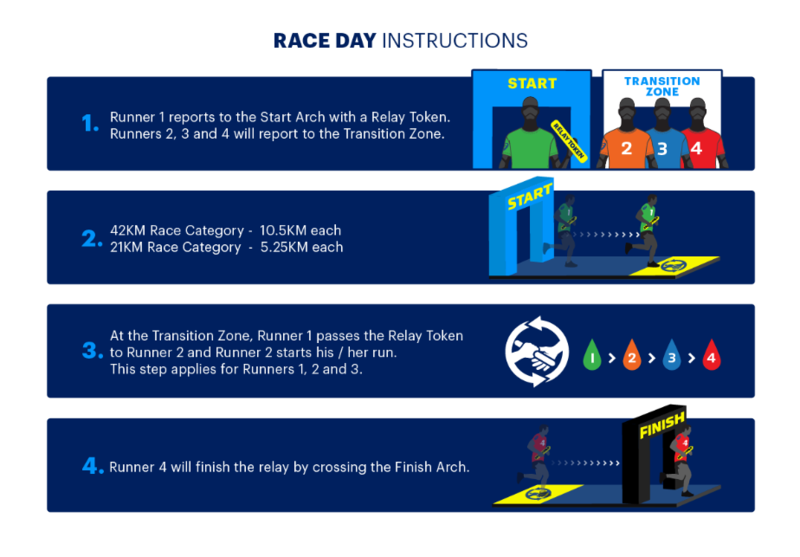 If your team registered for the 42KM race category, each runner must run 10.5KM at one go before handing the Relay Token to the next runner to start running. Do all four runners of the Relay assemble at the same location? Ans: No. All four runners in each team must assemble at their designated reporting locations before the stipulated time. The 1st runner reports to the Start Pen, while the remaining 2nd, 3rd and 4th runner reports to the Transition Zone. Please take note that any team with latecomers will be disqualified. Will all four runners receive the Finisher’s Medal? Ans: Yes. All four runners will receive a Finisher’s Medal each on the condition that the team finishes the race within the stipulated cut off timings. If one of my team member cannot make it on race day, can the rest of the team run the extra distance to cover for him or replace him with another runner? Ans: No. Due to safety & medical reasons, each team must consist the same 4 registered runners. Teams are not allowed to substitute any team members or have any member of the team run more than a leg of the race. In the interest of the runners’ safety, the organiser strictly prohibits and strongly discourages the sale, exchange, and/or transfer of race entries, since each race bib contains the registered runner’s medical information and emergency contacts, which is important for medical teams to provide immediate medical assistance should an accident occur. Any violation of the above mentioned restrictions by any teams will result in an immediate disqualification as deemed by the race organiser. Ans: When the 4th runner passes the Finish Arch, the team with the fastest gun time recorded wins. Can I change the size of my Race Singlet after completing my registration? Ans: Yes. You may do so via logging to your Spacebib account. *Singlet size selection is on a first come first served basis. 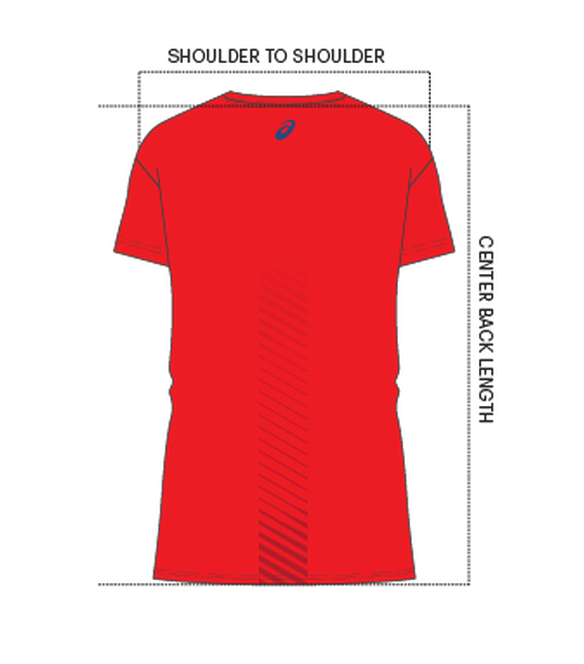 Will I be allowed to change the size of my Race Singlet during the Race Entry Pack Collection? Ans: Strictly no exchanges are allowed. Do I need to register as a team or can I register individually? Ans: You cannot register individually. Registration is only by team. 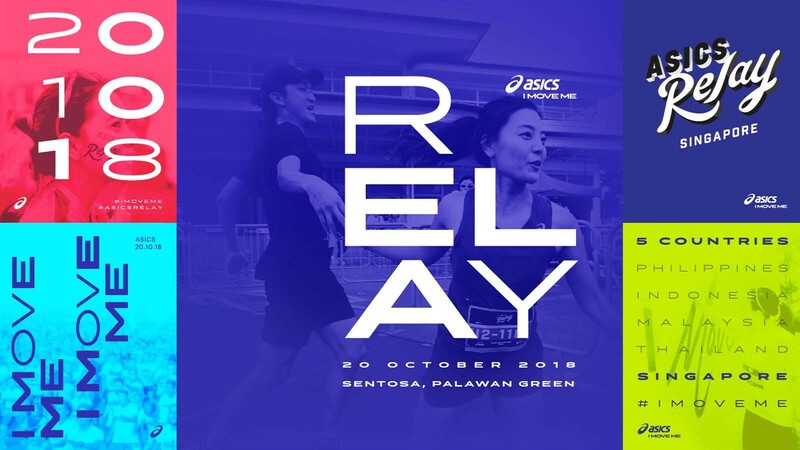 What is the minimum age to participate in ASICS Relay 2018? Ans: A participant must be 16 years and above on the race day to participate in both the 42KM Full Marathon and 21KM Half Marathon race category. What is the difference between a Male, Female and Mixed Team? Do I need to fill up the Indemnity form and seek parental/guardian consent if I’m below the age of 18 as of race day? Ans: Yes, participants below the age of 18 are required to seek parental/guardian consent before signing up for the race. They would be required to submit the signed Indemnity form during the Race Entry Pack Collection (REPC), failing which the Race Organiser reserves the right to refuse the entry of the participant. You can download the Indemnity form here. How will I know if my registration for ASICS Relay Singapore 2018 is successful? Ans: Participants will receive a confirmation email upon successful registration. Your unique Registration ID will be reflected on the confirmation slip. Why have I not received my confirmation slip despite registering and making payment? Ans: There could be several reasons: The Confirmation Email has been blocked by your mail server or treated as Spam. Please check your Spam Inbox. Your registration was not successful. The email address entered at the point of registration was incorrect. Do I get a refund if I choose not to participate after completing my registration? Ans: No. Registration fees are strictly non-refundable. Can I make changes to my particulars after completing my registration? Ans: Yes. You may do so via your Spacebib login. 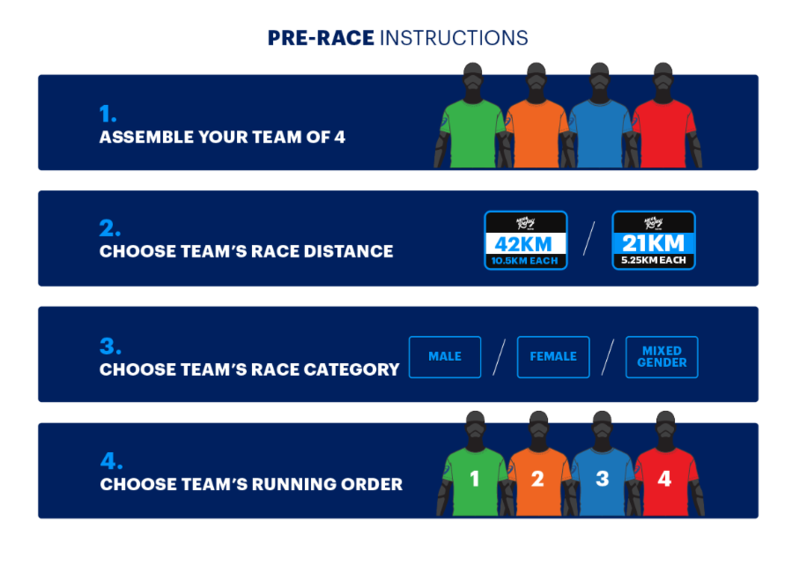 Please note that you will only be able to change the Running Sequence of your Team and your Contact Details. Any changes must be made 2 weeks before registration closes. Can I change my race category after completing my registration? Ans: Registration closes on 21st September 2018,or whenever slots are filled, whichever earlier. When will ASICS Relay Singapore 2018 be held? Ans: The run will take place on 20th October 2018, Saturday. Will there be baggage deposit service available? Ans: Baggage deposit will be made available to all runners. Runners are encouraged to arrive early to deposit their bags and avoid any delay as a queue is expected. NOTE: While maximum care and security will be enforced, the Race Organiser will not be responsible for any loss or damaged items. Participants who choose to use this service may do so at their own risk. Is it compulsory to wear the race bib? Ans: Yes. Participants without their assigned race bib will be refused entry into the starting pen. What is the flag-off time for each category? What are the Cut Off Timings? Ans: Yes. Photos will be uploaded on both website and our Facebook page after the event. Can I skate or cycle during the run? Ans: No. For the safety of all runners, skating or cycling is prohibited. Ans: No. Runners are not allowed to bring their pets along for the run. Ans: Yes, there will be distance markers along the race route. What if I am injured during the run or unable to finish the run? Ans: Runners can approach any of our route marshals or first aid personnel en-route to seek assistance.